Researchers from the University of Mannheim investigated brain activity in people at increased risk of bipolar disorder to see if there was something about how these people handled negative emotions that might them be at increased risk of mood cycles. They used a powerful brain imaging technique called functional magnetic resonance imaging that allows researchers to see which parts of the brain are being activated when doing different tasks. They were interested in how negative emotions were handled because a number of studies have suggested that difficulty handling negative emotions is a trait that is associated with depression and bipolar. had more powerful emotional reactions to images that were designed to trigger negative feelings… specifically their amygdalas (an area involved in fear, fight or flight and other extreme emotions) were markedly more active when passively viewing disturbing images. when they were asked to use a cognitive technique for reducing reactivity (cognitive reappraisal – essentially talking yourself down from an extreme emotional reaction) they were less effective at reducing amygdala activity. People with bipolar might benefit from cognitive techniques designed to deal with negative emotions. 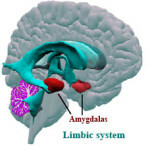 For example, Buddhist monks who do compassion meditation have been shown to modulate their amygdala during their practice.